So far, no curative therapy for ASM or MCL has become available. Some patients may benefit from inter-feron-a (IFN-a), glucocorticoids, or cladribine. However, in most cases, treatment responses are only shortlived. Therefore, a number of attempts are currently made to identify molecular targets and novel effective drugs that interfere with neoplastic cell growth in ASM and MCL. The pathological hallmark in SM is the multifocal dense infiltrate of MCs in the BM (or/and other visceral organs). Other typical features of SM include BM fibrosis,1-9-1 increased BM angiogenesis, and tissue and blood eosinophilia. [7'11] Recent data suggest that neoplastic MCs express several angiogenic and fibrogenic mediators such as vascular endothelial growth factor (VEGF), tryptase, or bFGF. Other data suggest that several surface molecules such as CD2 or CD25 are overexpressed in MCs in patients with SM compared to normal MCs. [12,13] However, little is known about the regulation of expression of these molecules in neoplastic MCs. 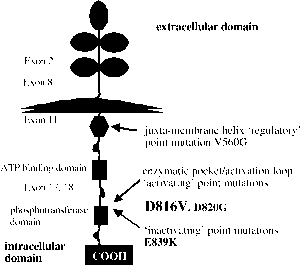 An attractive hypothesis is that the c-kit mutation D816V is involved in the regulation of expression of such genes. Fig. 1 Structure of c-kit receptor and localization of mutations. The c-kit receptor is composed of extracellular and intracellular domains. The most common mutation in c-kit, D816V, is located in the activation loop at the entrance to the enzymatic pocket of the c-kit kinase. like domains in its extracellular portion and an inter-kinase sequence that splits the intracytoplasmic domain into the ATP-binding domain and the phosphotransfer-ase domain (Fig. 1). 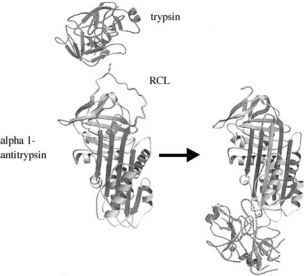 Binding of SCF to c-kit leads to receptor dimerization and autophosphorylation of tyrosine residues in the cytoplasmic domain. As a consequence, c-kit activates a number of signal transduction pathways. Especially the activation of PI3 kinase has been shown to contribute to important c-kit-dependent cellular functions such as proliferation, survival, or ad-hesion. [17,18] Apart from PI3 kinase, c-kit also leads to activation of Ras and MAP kinases. [16,19] Other signaling pathways reportedly activated by c-kit include JAK2, STAT family members, as well as members of the Src family. D816V is a point mutation in the c-kit codon 816 that leads to substitution of valine by aspartate and affects the activation loop at the entrance to the enzymatic pocket of the c-kit kinase (Fig. 1). c-Kit D816V exhibits constitutive tyrosine kinase activity and leads to cytokine-independent growth of MCs. Moreover, c-kit D814V (the murine homologue of D816V) transforms factor-dependent cell lines to growth factor independence and acts oncogenically in mice. However, the exact mechanisms by which D816V leads to constitutive activation of c-kit are unknown. A number of previous and more recent studies support the notion that D816V alters several features of the c-kit receptor including dimerization and signaling.1-21,22-1 One important mechanism appears to be an alteration in the activation of signal transduction pathways. Thus, recent data suggest that the signaling pathways activated by wild-type (WT) c-kit (in the presence of the c-kit ligand SCF) differ from the signaling pathways (constitutively) activated by c-kit D816V. As a consequence, c-kit D816V may modulate the expression of molecules that are critical for transformation, although the identity of these genes remains largely unknown.